This damage is pretty common in most homes with a wood subfloor. Threshold framing termite damage in this area could be quite extensive depending on the age of the house and how long the termites have actually been there. The problem with some door thresholds is they allow moisture or water to leak around them through small gaps or even holes in the threshold themselves. In a situation like this where the back door of the house had a concrete set of stairs poured next to the building itself allowed the moisture from the concrete to seep into the wood on a consistent basis. You can see the damage in between the rough framing for the door in the actual floor rim joist has suffered extensive termite damage compared to just a few inches away on the same piece of wood there is little damage from the termites. The damage here often is caused by concrete with no moisture barrier poured up against a part of the house that is made of wood. The moisture in the concrete has a almost magnetic effect towards the wood. 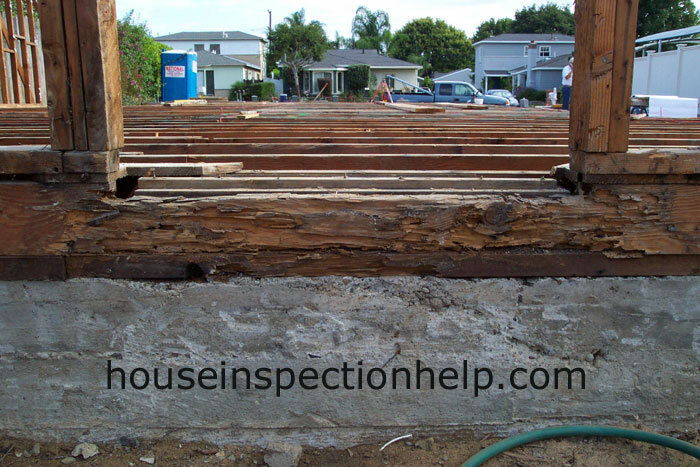 The moisture in the concrete will constantly be attracted to the wood or in other words the wood will actually pull the moisture out the concrete. As a home inspector this should be an important area to check because of the knowledge you now have.